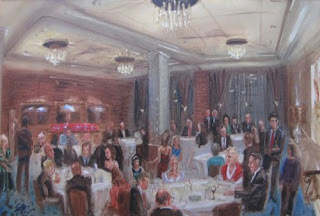 Any holiday party is worth a painting, I think, but this was a special one for this company. Their founder was retiring, and his associates commissioned a painting as a parting gift. The cozy ballroom at the Alexis was perfect for the family-like intimacy of these coworkers. And it was a short walk from my studio!